Our trips to the beautiful West Coast of Scotland have so far stopped at Oban. So this year, with a long held ambition tucked away to eat at the Three Chimneys, we headed for Skye for a week in August. It was beautiful in every sense, the weather, the scenery, the friendliness and the food, although we still haven’t made it to the Three Chimneys. Still, at least we have a cast-iron reason to go back. It’s a LONG way. A really long way from the south of England! We are lucky to have family in both Glasgow and Edinburgh allowing us a full day’s break in both directions, which I would recommend as there is a lot on offer for kids in both cities. And really, once you’re past Birmingham, it’s an increasingly scenic journey, with the Lakes, the Borders and Loch Lomond just some of the highlights on the way. Beyond Loch Lomond it becomes even more spectacular, with Glencoe and Eilean Donan Castle just a couple of the postcard icons on the road. The problem is not finding somewhere to stop but limiting yourself so that you actually get to Skye! The weather. I can’t deny that Skye and the West Coast in general get a lot of rain. On the other hand they also have a bit of a micro-climate – so this summer Skye had a drought and we only had one day of very light rain on our holiday. And if you take waterproofs and accept that two consecutive days where the sun shines is equal to an unmitigated success, you’ll be fine. Beasties. Midges abound in the summer, but we found that really with children you don’t tend to be outside at prime time as it coincides with bedtime. We did have to deal with a tick, but found the local chemist had a ‘tick card’ which is now part of our in-car first aid kit, and fortunately it was the more stoic child who was afflicted. She didn’t even notice! We stayed at Seaford Croft, just outside Broadford, which is the first town after the Skye Bridge. The cottage was well-equipped and had an enclosed back garden. The views from the cottage were lovely, and our main reason for choosing it was the proximity to the beach which was across a quiet single track road. The tide came right up to the side of the road in the morning, so we tended to go out then, but by mid-afternoon there was an expanse of sand leading to some good shallows to paddle in. We spent lots of time flying the kite, rock-pooling and building sandcastles all within very easy reach of the cottage and a warm drink! 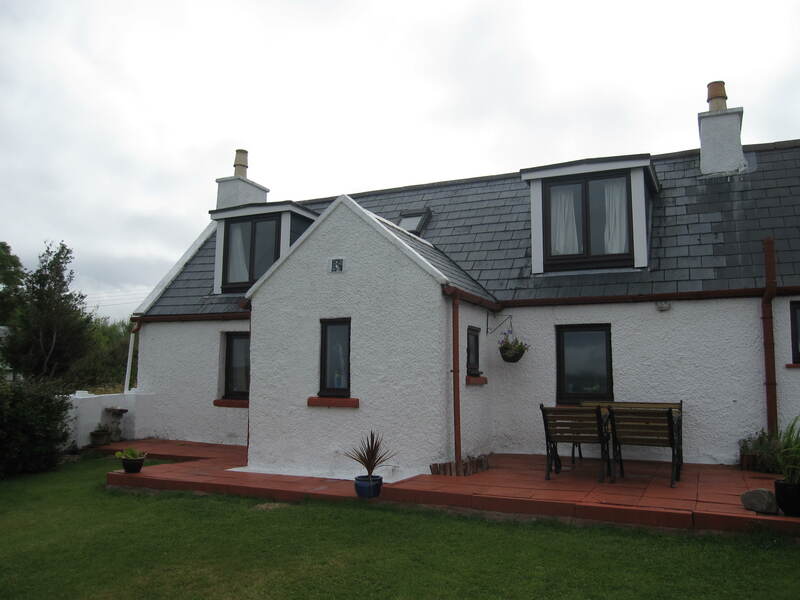 The other reason for choosing the cottage was its location close to the Skye Bridge and Broadford. Being close to the Bridge meant trips back to the mainland to visit Plockton and Eilean Donan Castle were relatively easy. Broadford has a supermarket, petrol station, play park (behind the Community Hall), a few shops, a very good fish and chip shop and a lovely seafood restaurant called Creelers, as well as the Skye Serpentarium which is a little bit strange but a good rainy day option. 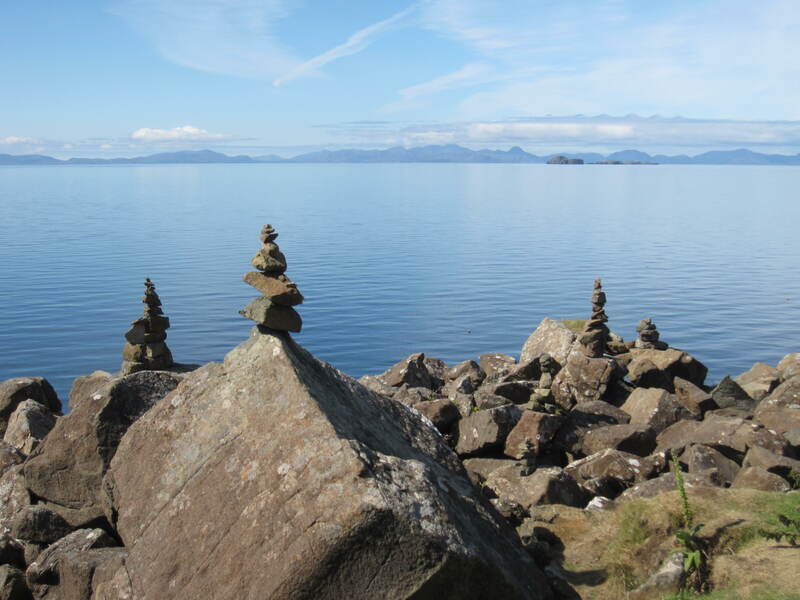 Skye has unlimited walking options and there are loads of outdoor options. As our girls are 5 and 3, they are not yet at the full-blown hiking stage (and I have never been at that stage) so although we did walk part of the route at the Quiraing my husband did spend quite a lot of time gazing wistfully at the Cuillin Mountains – again something to bring us back another time. Our two outdoor highlights were the Misty Isle Boat Trip and the Fairy Glen near Uig. However, for those of you worried about my husband’s hiking ambitions, being close to the Skye Bridge meant I could drive him one morning to the Five Sisters of Kintail walk, allowing him to bag three Munros in a day! The MV Misty Isle sails from Elgol – from the guidebooks I was expecting some sort of Fisherman’s Wharf equivalent – but instead drove down a steep road to stunning views, a stone quay and a couple of cabins. The girls loved the boat trip – Stuart’s commentary was funny and interesting, we saw lots of seals and some porpoises, ending up with a picnic at the sublimely picturesque Loch Coruisk. The trip back included biscuits and hot chocolate and a chance for the girls to ‘drive’ the boat which meant it was a pretty perfect day! 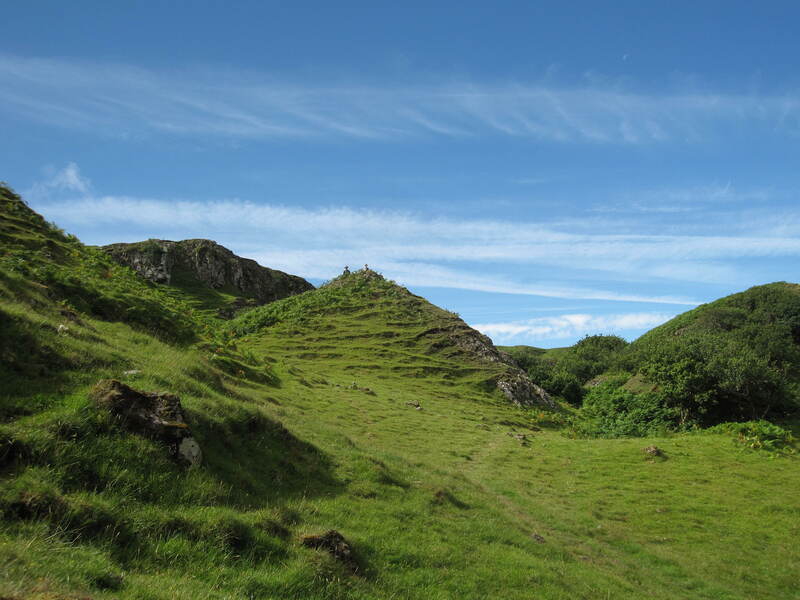 We found the Fairy Glen courtesy of the Lonely Planet guide, and it was worth the trip. Just before Uig, there is a turn-off for Sheader and Balnaknock, to a very minor road which is one of those ‘keep the faith’ roads where you wonder if a) you’re on the right road and b) you’ve missed the thing you’ve come to see. However it was very clear when we’d arrived at the Fairy Glen, as the lochan, mini-mountains and ruined cottage are straight from an Enid Blyton book. Charlotte climbed a ‘mountain’ as well as a number of trees, and while looking for fairies found 10p, which must surely have been left by the tooth fairy. There are no facilities there, just a unique landscape and the chance to exercise the imagination. 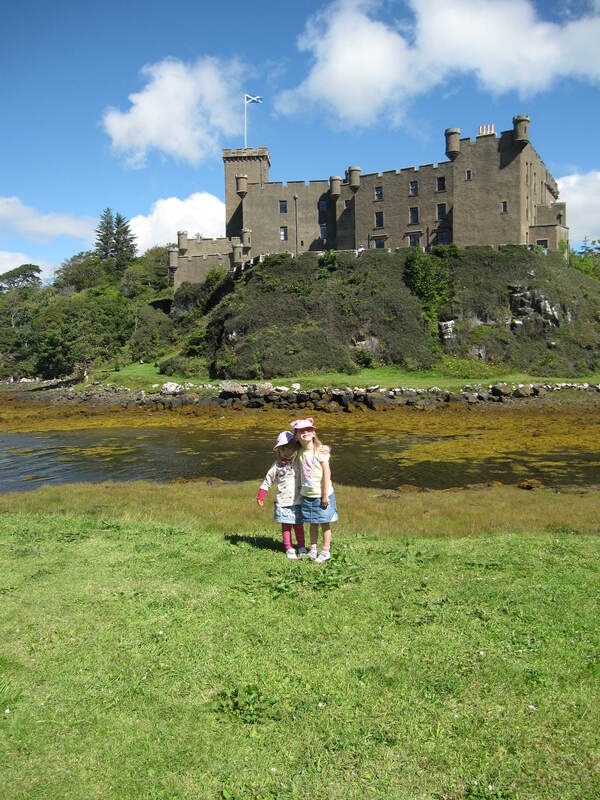 We also enjoyed three good days out at castles; Dunvegan Castle, Armadale Castle and Eilean Donan on the mainland. Dunvegan and Armadale both had beautiful gardens to explore with plenty to amuse the kids including a good adventure playground at Armadale. Eilean Donan is the archetypal Scottish castle. They had a great children’s trail leaflet and the staff in the castle were very friendly helping the girls find things and telling them stories. The staff in the cafe were also very helpful when Alice locked herself in the loo! All three locations had free entry for under fives and so we felt were good value for a family with young children. My recommendation of Skye is unreserved – it is simply stunning and although there can be a lot of driving round the island it is all through such beautiful scenery that it isn’t really a hardship at all. My cousin has just visited in October, staying near Dunvegan, and again had a week of good weather finding lots to do. Although most B&Bs and hotels were clearly full when we visited, nowhere felt busy, making for a very relaxing holiday with plenty to offer both parents and children. We will definitely be back. 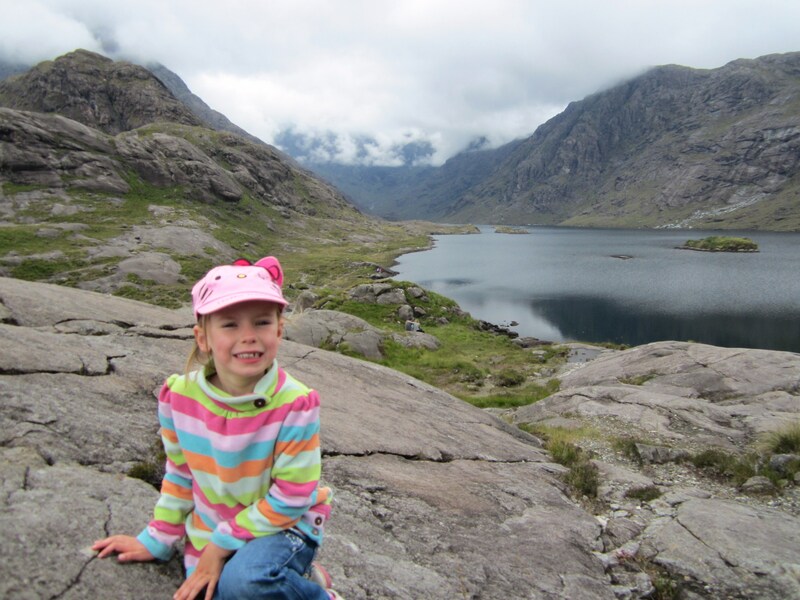 This entry was posted in Destination guides, UK and tagged family holidays to Scotland, Scotland family holidays, Scotland holidays, Skye, Skye with kids. Bookmark the permalink. Definitely!! 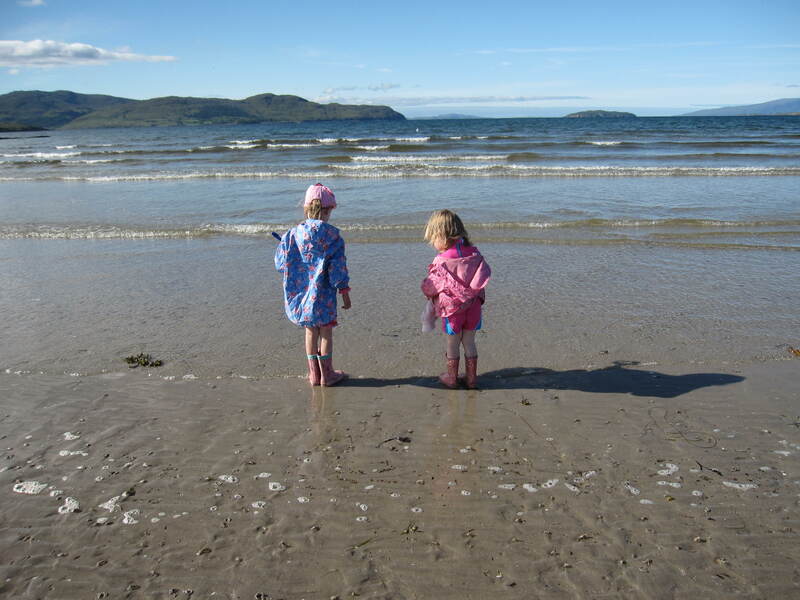 I have been to some beautiful places – Norway and Canada spring to mind – but nowhere makes my heart sing in the way the West of Scotland does – even with the midges. Hi Jenny – glad you enjoyed the article. Here’s what Linda says about the midges: ‘We didn’t find midges too bad – with young children you tend to be inside at the worst time (teatime/bath time. This year we were back in Argyll and took Avon Skin so soft after reading many great claims. Whilst we still had midges round us at times, we didn’t get bitten (and I am generally very prone to beasties) so I would recommend it – less vile than some insect sprays too. If you’re planning any substantial hill walking then spray and/or a hood are worthwhile investments, but midges have never seemed to bother the girls (6 and 8 on this holiday) over many holidays in the West of Scotland.